When you don’t have enough time to cook a nutritious breakfast, you probably grab something quick but unhealthy. 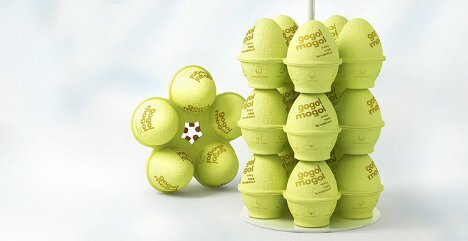 It would be easier to eat wholesome things if they didn’t need so much preparation – like boiled eggs, for instance. They come in a handy shell, of course, but unless you do some kind of cooking to that egg you’ll regret eating it for breakfast. 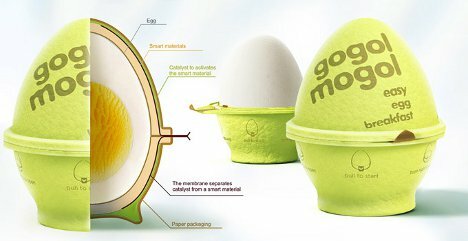 The Gogol Mogol from designers Kian Agency is a new kind of dynamic egg packaging that would let you cook a soft-boiled egg on the go. You need no stove, no pot and no scalding hot water, all of which people on the train tend to frown upon. 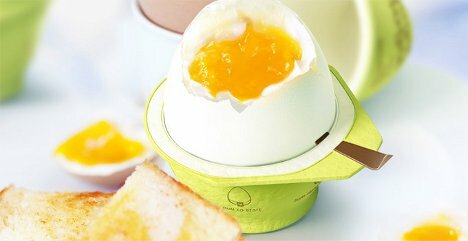 Thanks to a “smart material” inside the outer packaging, the egg cooks quickly inside its individual carton. You have only to pull a little tab to activate the cooking action. 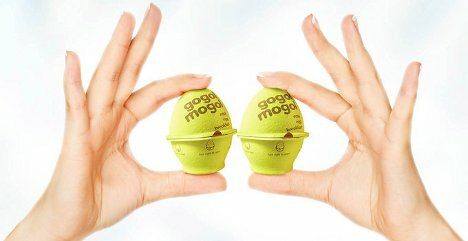 The unusual packaging also stacks up easily in the supermarket, with five-packs piling up securely around a central pole. A pack fits nicely into a bag or lunch box, with the exterior packaging offering a bit of extra protection to the fragile eggs inside.